Ben Hodges summarized our IVER2/Ecomapper operations during the first SPURS cruise (KN209-1) in a new WHOI technical report and a recently-submitted JPO manuscript. Graduate student Nick Woods presented intial results from his thesis work on copepod aggregation in the Great South Channel at the 2012 AGU Ocean Sciences Meeting. A paper summarizing our NSF-sponsored investigation of North Atlantic subtropical mode water circulation during the CLIMODE program has been accepted to DSR-II. 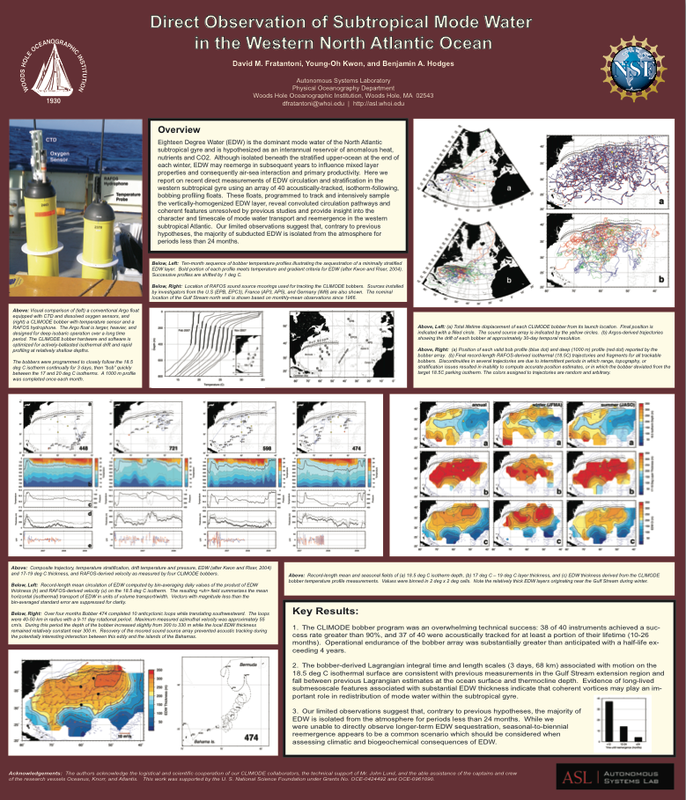 A companion poster was presented at the 2012 AGU Ocean Sciences Meeting. 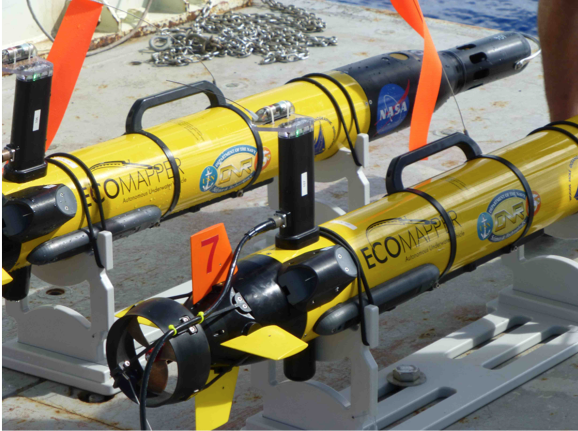 The ONR funded AOSN program was the first large-scale application of underwater gliders as a component of an ocean prediction system. A special issue of DSR-II was dedicated to results of this program. Our work with direct velocity and acoustic backscatter measurements from autonomous gliders was profiled in the October 2009 issue of Marine Technology Reporter. The Submerged Autonomous Launch Platform (SALP) is a moored device for serial deployment of floats and drifters. 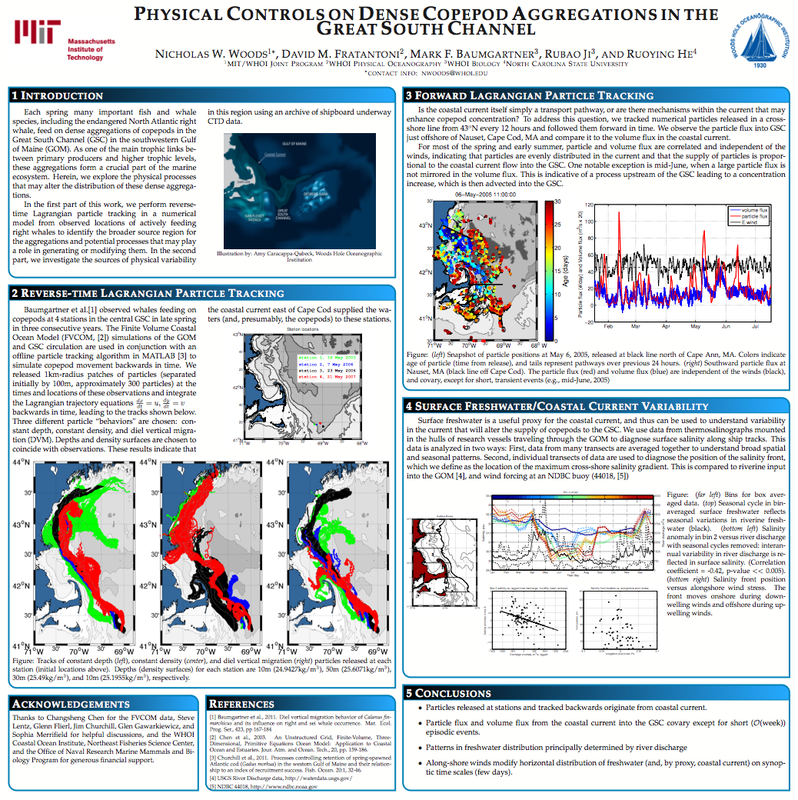 Initial results were presented at the 2010 AGU Ocean Sciences Meeting. The Autonomous Expendable Instrument System (AXIS) is a self-contained, satellite-linked, robotic autolauncher for XBT and XCTD probes. The prototype AXIS unit is deployed on M/V Oleander, a container vessel which makes weekly trips across the Gulf Stream between New Jersey and Bermuda.